CBS announced its fall television lineup today, and the network seems to be charting very familiar territory. While the other broadcast players scramble for the next big thing, CBS is firmly in cruise control. It would be easy to say that the the channel is just going through the motions, but the folks at CBS know what works and know their audience even better, which is why they’re still the reigning champs of broadcast television. This year, the channel that brought you NCIS and NCIS: Los Angeles, brings you their next surefire hit, NCIS: Somewhere Else, plus another half dozen police procedurals and two new comedies… one of which is actually a really old comedy. In these hardscrabble times, it may be difficult to decide which NCIS to watch, so we’ve rounded up all the new shows in CBS’s 2014-2015 lineup. What’s It About: Eccentric genius and his team of misfits battle against high tech threats of the modern age, but the socially awkward group needs a translator of sorts, to help them communicate to the world around them. Who’s In It: Elyes Gabel, Robert Patrick, Katharine McPhee. What It Sounds Like: The Big Bang Theory meets Criminal Minds. How Good Will It Be: It looks like This show looks like it might try to mine the same kinds of humor as The Big Bang Theory, which often nosedives into silly stereotyping of nerd culture without being actually funny or insightful. This one isn’t looking good at all. How Long Will It Last: CBS might be trying to find a bridge between the faux-geeky comedy in Big Bang and the litany of cop procedurals on the network. Perhaps the network’s audience will pick up on that. Airs: Mondays at 10 PM this fall. What It Is: Police procedural. What’s It About: The local field office investigates criminal cases involving military personnel. Who’s In It: Scott Bakula, Lucas Black, Zoe McLellan. What It Sounds Like: It’s going to be NCIS, but everyones going to be talking about gumbo. How Good Will It Be: As good as an NCIS spin-off can be. Scott Bakula is great, but we doubt he’s going to flourish in this. How Long Will It Last: Forever. Airs: Tuesdays at 9 PM this fall. What’s It About: Det. Jack Larsen and his new boss, Lt. Beth Davis, investigate dangerous stalker incidents. 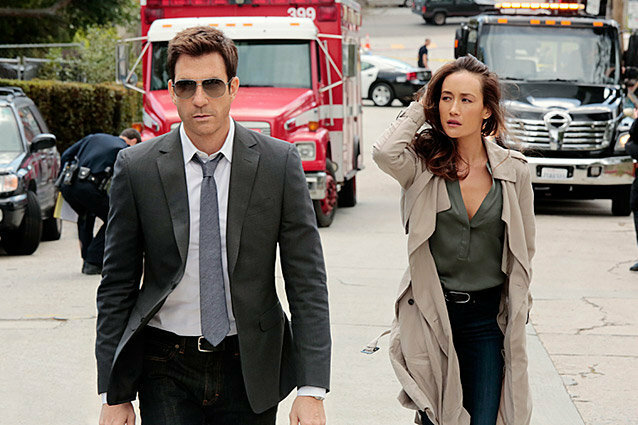 Who’s In It: Maggie Q, Dylan McDermott. What It Sounds Like: The inevitable Catfish episode of Law and Order: SVU. How Good Will It Be: CBS already has about 90 other cop shows, and this one isn’t doing much to stand out. There’s a new wrinkle (hey, we’re only going after stalkers in this on) but that’s no enough to separate it from the herd. How Long Will It Last: McDermott’s last show on CBS, Hostages, was a big misfire for the network. Plus, there are already so many procedurals clogging up the network’s schedule. We’re thinking some cop drama fatigue might be creeping in. Airs: Wednesday at 10 PM this fall. What It Is: Political drama. What’s It About: Elizabeth Cord, the newly appointed Secretary of State, balances work and family life while trying to serve the President. Who’s In It: Téa Leoni, Bebe Neuwirth, Geoffrey Arend, Patina Miller. What It Sounds Like: House of Cards without all the murder by train. How Good Will It Be: It looks a little staid compared to the wilder political action available from other dramas of its ilk. Still, maybe a slower drama depicting Washington is a move in the right direction. How Long Will It Last: House of Cards and Scandal has shown that political shows can survive and thrive on TV as long as they’re soapy and ridiculous. Madame Secretary looks a bit tamer than those two efforts so thrillseekers might not be interested. We’ll give it a season or two. Airs: Sundays at 8 PM this fall. What It Is: Multi-camera sitcom. What’s It About: The gay son of a brash Boston family wants to leave the city, but decides to stay when his outspoken and politically incorrect father gives him a position as an assistant coach on the local basketball team. Who’s In It: Laurie Metcalf, Tyler Ritter, Jack McGee. What It Sounds Like: That one episode of All in the Family where meathead comes out to Archie. How Good Will It Be: We’re excited to see Laurie Metcalf return to TV, but the story itself doesn’t sound all that original or exciting. How Long Will It Last: Since Fox’s Dads failed to deliver ratings, it seems that we might be a bit tired of the whole “outspoken fathers annoying their sons thing” on TV. This one might not get a back nine. Airs: Thursdays at 9:30 PM this fall. What’s It About: Special Agent Avery Ryan is in charge of the Cyber Crime Division of the FBI, a team that solves crimes centered on the Internet. Who’s In It: Patricia Arquette. What It Sounds Like: CSI meets the Internet. How Good Will It Be: It depends which The Who song they chose for the theme song. How Long Will It Last: Forever, or at least a handful of years. What’s It About: Two bickering detectives with polar opposite world views work together to clean up the mean streets of Battle Creek, Michigan. Who’s In It: Josh Duhmel, Dean Winters. How Good Will It Be: Dean Winters is always great, and television heavyweights Vince Gilligan (Breaking Bad) and David Shore (House) are producing. This could be something special. How Long Will It Last: This series seems darker and grittier than the average CBS procedural, which might not click with regular viewers of CBS’ breezier cop dramas. We’ll be surprised if this gets a second year. What’s It About: Charming slob Oscar Madison and buttoned-up neat freak Felix Unger become unlikely roommates after the demise of their marriages. Who’s In It: Matthew Perry, Thomas Lennon. What It Sounds Like: Well… The Odd Couple. How Good Will It Be: We can’t imagine what new spin this new show could put on the Odd Couple formula since every other sitcom is basically a pastiche of the Odd Couple anyway. Been there, done that. How Long Will It Last: Matthew Perry has been on a serious losing streak so he may be a bad omen for The Odd Couple. we’ll give it a season.